Award-winning and critically acclaimed English baritone and composer Alex Poulton has performed in recital in major festivals throughout Europe and in many of the worlds leading concert venues from ‘The Wigmore Hall’, ‘The London Palladium’ to ‘The De Doelen’, Rotterdam. Alex studied under Julian Pike and performed in masterclasses in Germany under the legendary Dietrich Fischer Dieskau. His core repertoire includes all three of Schubert’s song cycles. He also sings art song for BBC television and has appeared on ITV, working in collaboration with Keith Cheetham, Robin Bowman and veteran Radio 3 broadcaster Piers Burton-Page. At The Royal Birmingham Conservatoire Alex won the Reginald Vincent Lieder Prize and was awarded a scholarship from the Joseph Weingarten Memorial Trust, to study Opera at the Franz Liszt Academy, Budapest and lieder at the Weimar, Hochschule für Musik Franz Liszt. 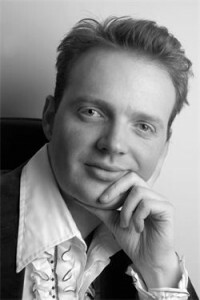 Alex Poulton has exceptional gifts communicating the particular character of each song. Whether in the haunting poignancy of Butterworth’s ‘Is my team a ploughing?’ or the flippant dexterity of Coward’s ‘Mad Dogs and Englishmen’, Alex Poulton knows how to point the words. The capacity audience loved his wide ranging and satisfying recital.